So me and Daniel actually met online via ‘uniform dating’ I did a brief stint in the army and well Dan done 11 years and was waiting to come out. I signed up for 3 months but started talking to Daniel on the first day (Wednesday). He asked to meet up that Friday 31st August 2012 in La Parrila in SA1 and never looked back. After a few months of meeting up on the weekends (as Daniel was still in the army) Daniel went to Dubai for the rugby 7. There he made a build a bear for me with a wish in. When I asked what he wished for he wouldn’t tell me at first but he later said that he wished for me to marry him although he said he wasn’t going to ask for a while. A few weeks past and we went for food in the grape and olive I was a bit tipsy and sent Dan a FB message saying will you marry me! I thought he was tipsy too so would probably forget in the morning but forgot he was driving . He said yes but had a very bad case of food poisoning so we didn’t talk about it for a few days. We didn’t tell anyone for a few weeks Daniel wanted to get a ring and do it properly you know. So when the ring came we went to la parrilla and he got down on one knee outside. 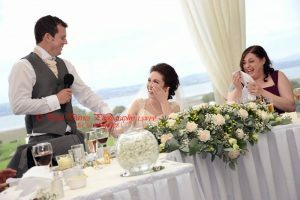 Planning the wedding was fun in most parts as Sarah is one of my best friends the only place we could get married in Swansea was of course Oceans View. Apart for me knowing Sarah, Lynne and Viv the view is just simply outstanding and the food is lovely. 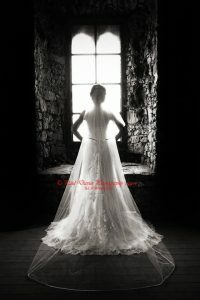 We found that booking the major things first like the church the venue the photographer and videographer first. we made the mistake of leaving the videographer to the last minute as booked someone but they had double booked so ended up with my uncle filming it all he did a fab job. We left everything else till about 4 or 5 months before we had the lovely Elaine do our wedding flowers. She done an amazing job. I told her what we had in mind and she blew our minds with the outstanding job she done in the end. 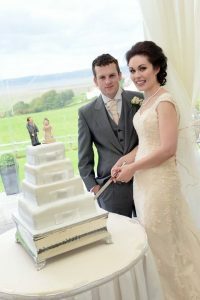 The theme was probably chosen by my dress if I’m honest as it wasn’t white so limited as to what went with it. We had grape bridesmaids dresses and my dress was a champagne/golden colour and Daniel wore a grey suit with a tie the same colour as my dress and the groomsmen wore the same but the tie matched the bridesmaids. The stationery on the table we done it ourselves my father has lovely writing so he done all the place cards and the cards on the gifts (whiskey and vodka) saying thank you he done them all. Exquisite by design done all the invitations and menus oh and order of service we went with them as Sarah recommended Sharon there they did a fantastic job. The only real bit of advice that I can give new brides is that it’s your wedding day try not to let family dictate to you who sits where and why. That’s the only thing we found difficult and spent countless sleepless nights over. Also just enjoy every single moment of it be that the planning the build up and the day and try and make time for just the two of you on the day as it can get so busy seeing family that you haven’t seen for ages. Oh and with favours try and get something edible so they don’t go to waste as people forget to take things like mini love spoons or key rings etc.